House Update - we have a deck! The deck is up, shutters are on, banisters have been stained, doors are in, baseboards are down, mantle and fireplace look great and the hard wood floors are getting started! I'm sure many of you have been slightly tarnished with the infamous "lenten tuna sandwich" many times in your life. Well, I'm glad to tell you I've made a much improved version that is sure to change your negative thoughts about tuna sandwiches. This, my friends, is a sophisticated tuna melt - AND, its low fat, contrary to its infamous counterpart! Mix tuna in bowl with the mayo, spread evenly onto thinly sliced baguette and top with cheese. Place in toaster oven for 4-5 min. until cheese is melted. Makes approximately 8 slices. I've also made this using a block of sharp cheddar cheese - clearly it was better without being reduced fat and "the real stuff". We made a full weekend out of getting our new Kitten, by taking a trip to Washington, DC, and then picking him up on the way out of town! We sure enjoyed all the history of the town! Two nights on the town, great food and we even got a front row seat to watch the KU game on TV! 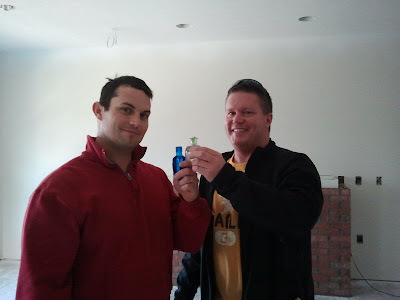 We had our first official drink in the new house! Cheers to being together 5 years. 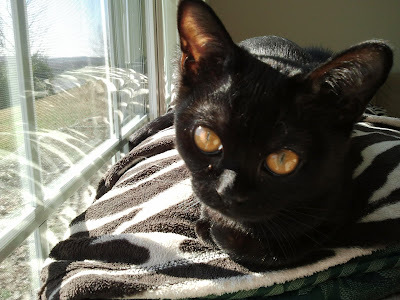 Valentino - The First Two Weeks! We are finally getting our first kitten together! 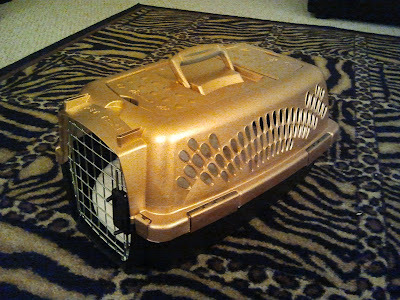 Here is my first kitten project..I enhanced the carrier with some gold spray paint. It looks dramatically better! p.s. - It's not splotchy in person, I think it was too shiny for the gold and the flash.